Grand Manan has much to offer Grand Manan has much to offer in scenic vistas and wildlife but the rich culture, natural history and art are best described in our fantastic museums and art gallery. Gallery openings, evening presentations and special events are offered throughout the summer so check the schedule of events for times and locations. Although great rainy day activities, these facilities should not be missed. 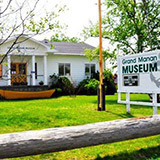 The Grand Manan Art Gallery is open June 7 to September 27, 2014, Monday to Saturday from 11:00 to 6:00 PM. We’re open on Sunday from 1:00 PM to 5:00 PM. Exhibits feature local and visiting artists with a connection to Grand Manan Island. 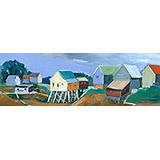 For a current exhibit schedule visit: www.grandmananartgallery.com Admission is $2.00. Children under 12 are free. Donations are always welcomed. We're always looking for volunteers to help out! Monday to Saturday from Noon to 7:00 PM and Sunday from 1-5 PM, mid-June to late September. Centrally located in Grand Harbour, our large community museum offers the Allen Moses Memorial Bird Collection, the McLaughlin Marine Galleries (containing many fishery exhibits as well as the Second Order Fresnel Lens from the Gannet Rock Lighthouse, Est. 1831), the L.K. Ingersoll Gallery of island history and cultural exhibits, a large six wall Marine Gallery Mural Exhibit featuring 139 species of marine life, a display of Island Geology, a Shipwrecks Gallery, the Deep Cove One-Room School House Exhibit, and the Grand Manan Archives of documents, photographs, and genealogical records. Twice weekly evening presentations throughout July-August, special events, and new exhibits yearly, compliment the more than 18 permanent galleries. The present museum was a Canada Centennial Project in 1967 and truly displays a “Living Reflection of Island History”. Admission is $7 for adults, $5 for seniors, $5 for students and free for kids 10 and under. July and August: Monday to Saturday, 9 am - 5 pm, Sunday, 1 pm - 4 pm. September: Monday to Friday, 9 am - 5 pm.